Find out more about Tagore, Santiniketan and the exhibiting artists Anna Boghiguian and Goshka Macuga. About the exhibition: Iniva (Institute of International Visual Arts) presents a unique collaboration between artists Anna Boghiguian and Goshka Macuga centered on the work of one of India's most important figures of the early twentieth century, the poet and polymath Rabindranath Tagore. Tagore's Universal Allegories features two unexpected responses to Tagore's legacy and suggests how his work and ideas still resonate for artists today. We see how Tagore's approach to art and culture as well as subjects including ecology, education, cosmopolitanism, nationalism, and the universal, compel our interest and demand to be translated into terms that reflect the contemporary world. âTagore has the capacity to make us think about our times through the filter of shattered ideals.' Indian cultural critic, Rustom Bharucha. Taking Santiniketan, Tagore's school, university and utopian community in West Bengal as a starting point, the two artists create installations that in different ways reflect this environment. 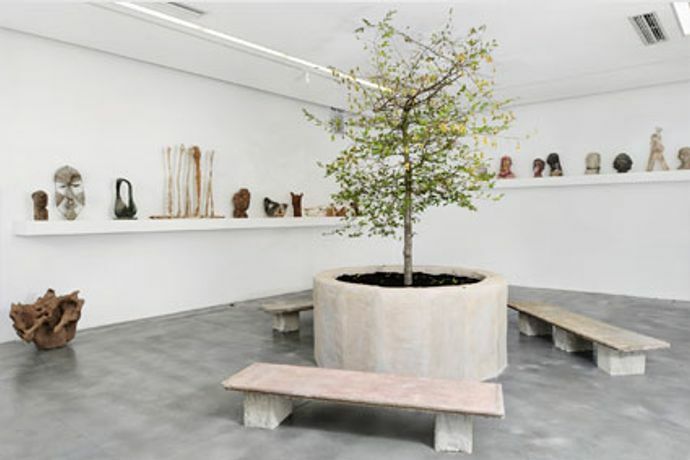 Shown in separate galleries, the installations are conceived in relation to one another and include several overlapping elements. This exhibition is Anna Boghiguian's first significant showing in the UK. She premieres a new commission for Iniva, incorporating a group of works made during several months spent at Santiniketan this summer. A small stage at the centre of the gallery populated by papier mache figures elicits Tagore's love of theatre and directly references his allegorical play, The Post Office. Also on display are a new series of the artist's drawings, photographs, small scale sculptures and embroidered fabrics. Volumes of Tagore's poetry, drama, literature and essays are shown in a bookcase alongside Boghiguian's own sketchbooks. The intuitive and expressionistic rendering of figures and use of text recall Tagore's own artworks produced later in his life. Goshka Macuga reworks When was Modernism? (2008) an installation that evokes Kala Bhavana, the art college at Santiniketan, realised after a field trip there in 2006. 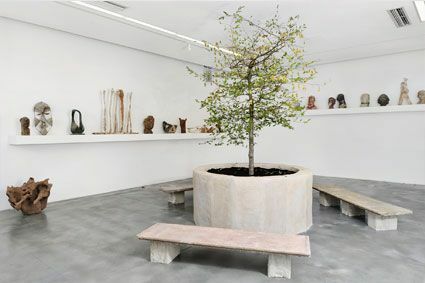 With stone benches arranged around a tree, the piece echoes the outdoor campus of Santiniketan, while a display of over thirty discarded student test pieces can be seen as fragments from a little known history of modernism extending across different geographies and time periods. The continuity of materials and aesthetic allude to the school's early modernist roots in the 1920s and correspond with the formal exercises Macuga herself undertook as a student in Poland. There is a display in the education space of books, documents, photographs and a film from the specialist library and archive of the Tagore Centre UK, giving audiences an opportunity to engage with Tagore's work and teaching. The exhibition will be accompanied by a dynamic programme of events, including tours, talks on themes raised, music and performances delivered and curated by artists.